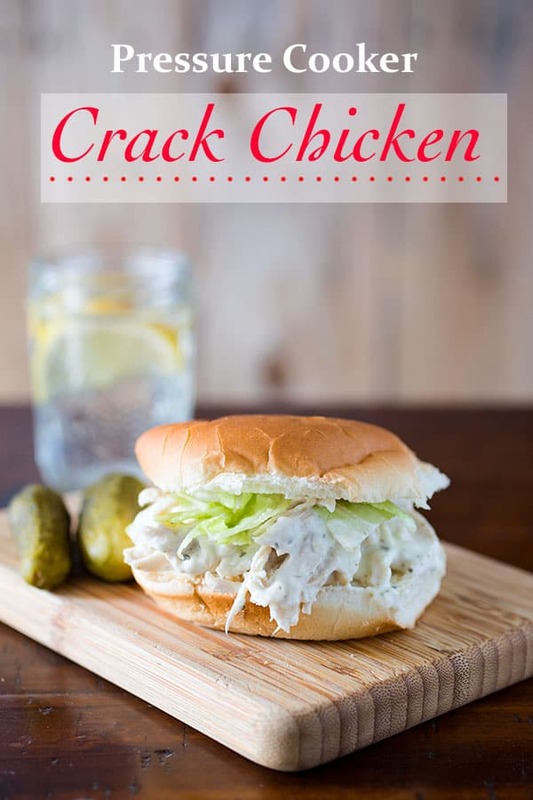 Pressure Cooker Crack Chicken comes together in minutes in an Instant Pot or electric pressure cooker. Makes great sandwiches or an easy casserole. This recipe is perfect for a quick weeknight meal. This means that Facebook cooking videos were basically designed with me in mind. The other day, one kept popping up in my feed: Crack Chicken from Cookies and Cups. The video had OVER 61 million views. That’s means about 20% of Americans had possibly seen the video. Twenty percent! So I did what anyone does when they see a viral video. I shared it. First, I sent the video to my mom. “I’d eat it.” he said. That settled it. I had to try the crack chicken. It looked rich and over-the-top and, honestly, not a recipe I’d normally make. But if we only make recipes that we’d normally make, things get boring. Fast. There was only one problem. I’m currently having a fight with my slow cooker. 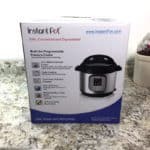 I’ve thrown it aside for my new love: the Instant Pot. I needed to tweak the recipe a little. The original recipe contains only four ingredients: chicken breasts, cream cheese, a packet of ranch dressing mix, and –at the end–crumbled bacon. While this makes for a really easy recipe, it’s a problem for a pressure cooker. Pressure cookers require liquid to reach and maintain pressure. Without adequate liquid, the sealing valve won’t lift into place. I added one thing to the recipe and, boom, Pressure Cooker Crack Chicken made it’s debut in my kitchen. Whisk a half packet of ranch seasoning into the water. You can do this in the measuring cup or right in the insert of the pressure cooker. This step prevents the dressing from clumping and distributes it evenly. The original recipe called for the entire packet of ranch seasoning. I found that to be a little too much ranch for my taste. So I reduced it. 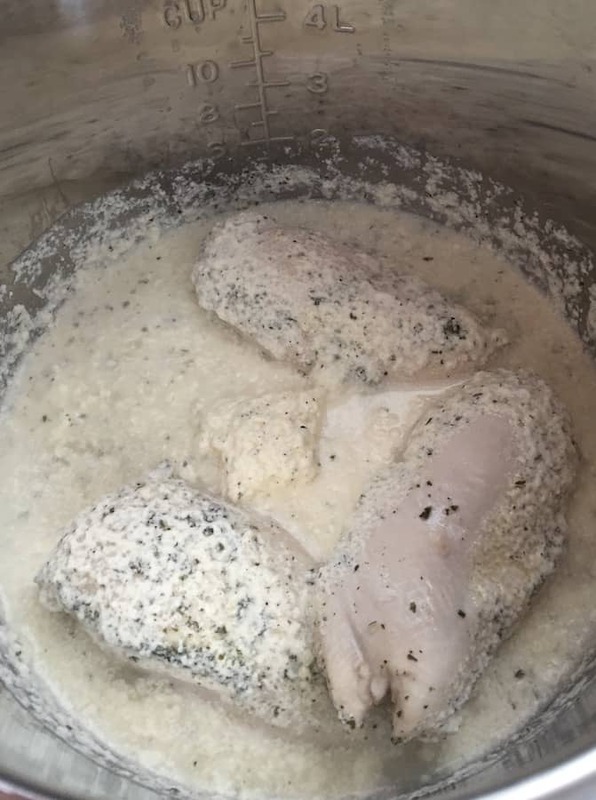 Plop the chicken, cream cheese, and ranch mixture into the pot of your electric pressure cooker. Since I wanted my crack chicken to be a little more chicken-y than cheesy. I upped the ratio of chicken to cheese. 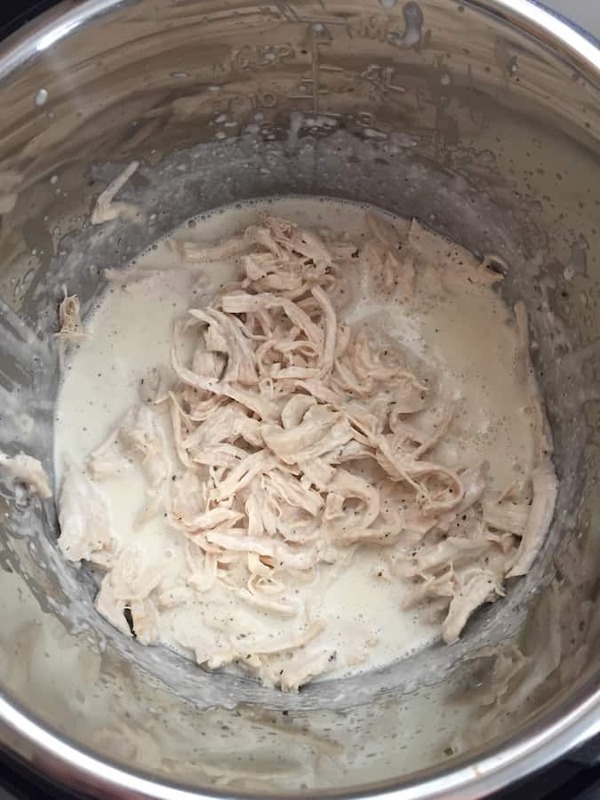 I used 1 1/2 pounds of chicken to one block of cream cheese, instead of a 1:1 ratio. Cook under high pressure for 15 minutes. Then allow the pot to sit for five minutes before releasing the pressure. If you open the pressure cooker too fast, the chicken will be cooked but it will be hard to shred. Ta-da! Doesn’t that look…clumpy and kind of terrible? Yeah. I thought so too. In fact, I kind of freaked out a little. I removed the chicken from the pot and set the sauté feature to low. (Or “less” in Instant Pot lingo) A quick stir with a whisk took care of the lumps. I left the sauté feature on to reduce the liquid a little while I shredded the chicken. Unlike the version made in the slow cooker, the sauce for this crack chicken is a bit thin. It’s less like chicken salad, more like a creamy pasta sauce. We thought this was a good thing! Shred the chicken with two forks. It should come apart easily. When I shred chicken, I don’t full shred it because I don’t want it to get mushy. For pork and beef, I pull it into thin pieces. This is just a personal preference. 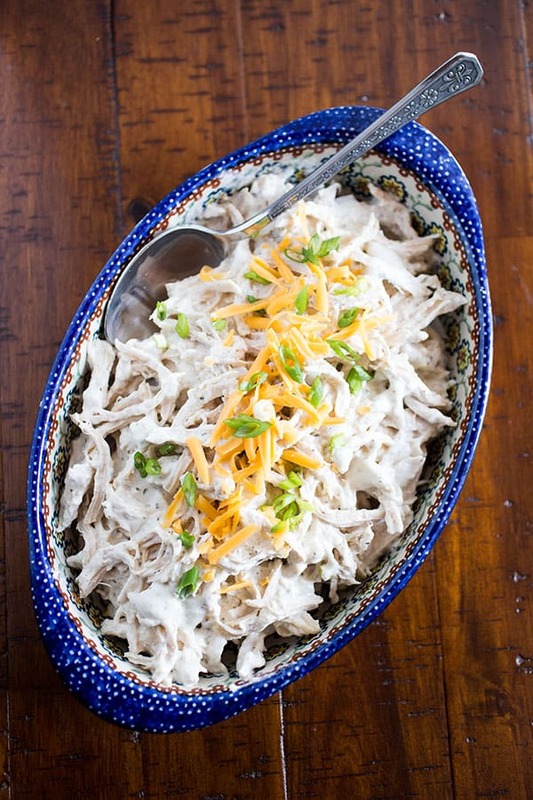 Return the shredded chicken to the pressure cooker. Stir. Season with freshly ground black pepper and additional dressing mix if you think it needs it. Serve! You’ll notice that I skipped the bacon. Can we be real here for a second? I didn’t think this needed bacon. So I didn’t add it. If you want bacon, go for it! Now, here’s a question: what to serve it with? Make sandwiches. Serve the chicken on a toasted bun. Add shredded cheddar, crumbled bacon, and lettuce. Make Crack Chicken Pasta. 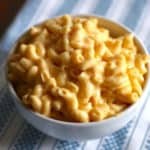 Toss the pressure cooker crack chicken with a half pound of cooked elbow macaroni. If it’s too dry, add a splash of warm milk. Make a Spinach Casserole. I did this! And, oh my goodness! SO GOOD. Add one small package of baby spinach to the pulled chicken. Stir occasionally for about three minutes until the spinach wilts and cooks. Serve over rice. Make Loaded Baked Potatoes. Bake a few Russet potatoes, split, and top with crack chicken, cheese, and steamed broccoli. Serve with Rolls. King’s Hawaiian Rolls go great with this recipe. Toss a large green salad together with a vinaigrette and you’re good to go. Serve Burrito-style. Roll up the chicken in flour or corn wraps. Add olives, pickled jalapenos, cheese, and salsa if you feel like it. Add your serving suggestions in the comments! Pressure Cooker Crack Chicken. Great for sandwiches, casseroles, and dips. Makes an easy weeknight meal. 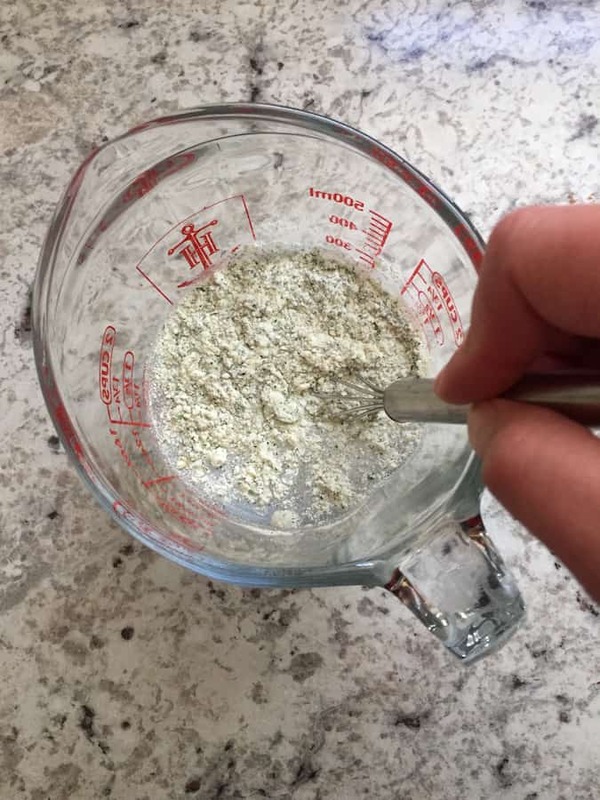 Combine water and dressing mix in a small bowl. Whisk until smooth. 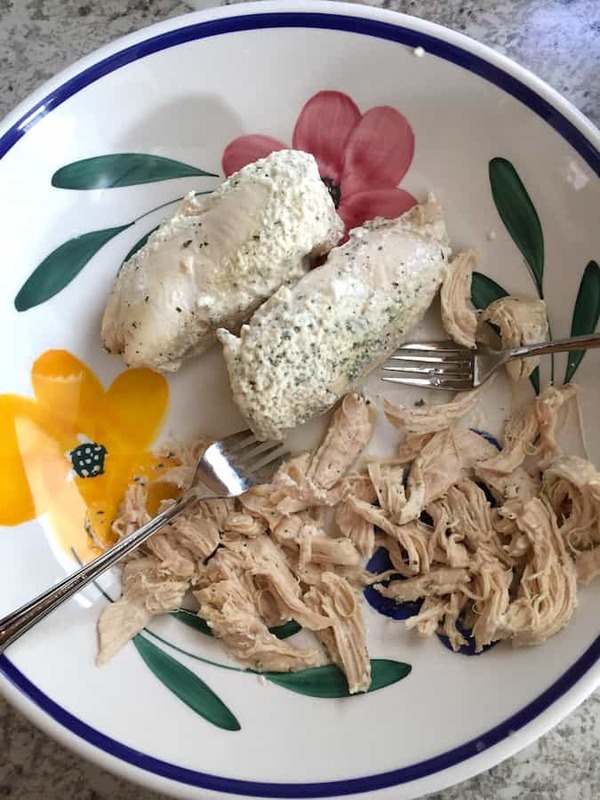 Combine dressing mix, chicken and cream cheese in the cooking insert of an electric pressure cooker. When the cooking time ends, allow the pot to sit for five minutes. After five minutes, turn the sealing valve to release for a quick pressure release. 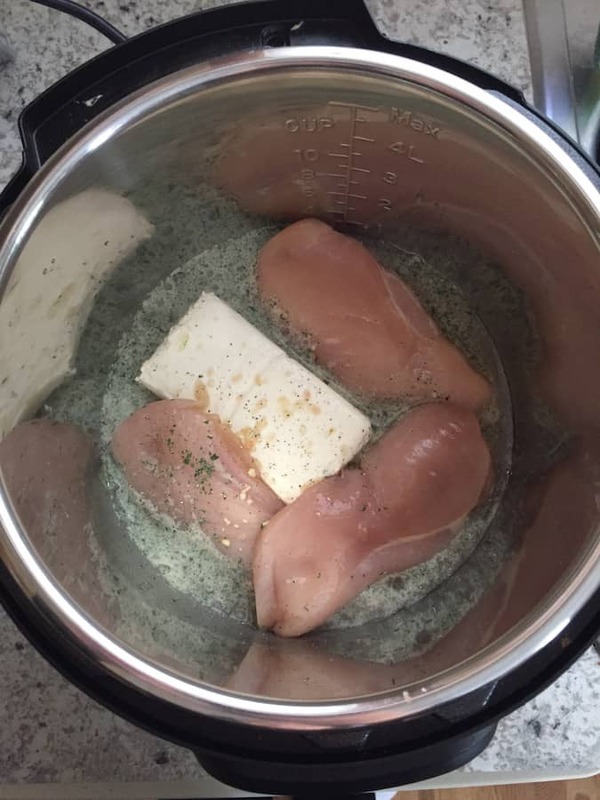 Remove the chicken and place in a large bowl. Select the saute setting and turn it to low (or less on an Instant Pot). Whisk the cooking liquid until smooth. Allow it to simmer and thicken as you shred the chicken. Shred the chicken with two forks. Keep an eye on the cooking liquid. If it looks like it's getting too thick, turn off the saute setting. Return the shredded chicken to the pot. Stir to combine. Season with freshly ground black pepper and additional dry dressing mix, as needed. Serve on buns or using one of the serving suggestions listed above. This was delicious! We did it over baby kale and it was super good. I feel like I might use more of the flavor packet next time…well maybe the next next time since I already have a half here! Thanks! Could I do this with frozen chicken breasts or do they need to be defrosted first? Can’t wait to try it! Frozen works fine. The pot will take longer to come to pressure. I usually add a few minutes if cooking with frozen. I’d do this for 15 minutes if the breasts are frozen. I did mine tonight with frozen chicken breast and set in on manual for 20 minutes. Turned out great. My family says I must do some again. Thanks for the recipe! Not being one to leave well enough alone, I diced a red pepper and an onion and used some chicken broth I’d just made. I added an extra half cup though and after I shredded the chicken, added what I had left of baby spinach. That took care of the color problem! I left it a bit soupy since I fix dinner in the morning to pack my husband’s dinner for work. The rice it was served on will likely absorb some of the juice. have you ever doubled the recipe? If so would you add time to the cooking? As long as your pressure cooker is large enough, it doubles with ease. Remember not to fill the pot more than half full. Cooking time remains the same. Do you need to double the liquid when you double the recipe? My cream cheese didn’t melt during the cooking, and didn’t assimilate well during the thickening. It almost looks curdled. Have you encountered this problem? 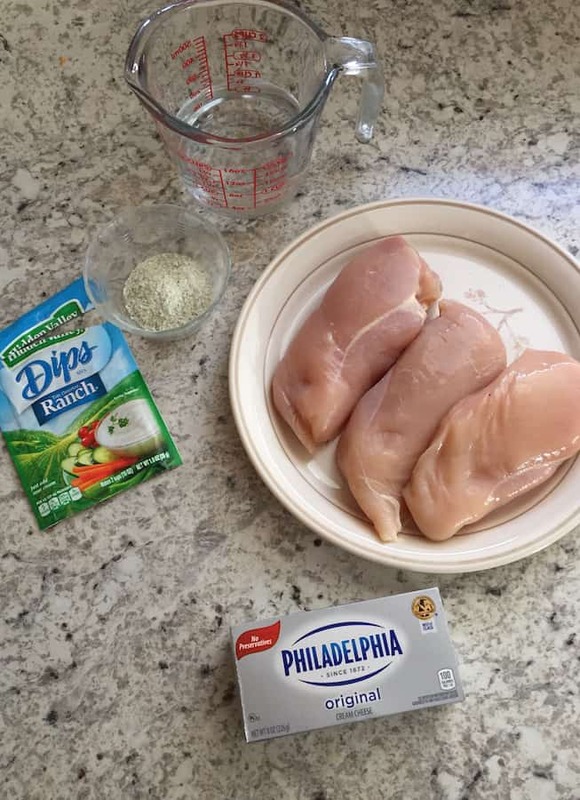 After cooking did you remove the chicken from the pot and whisk the cream cheese? That usually settles things down. I haven’t had the cream cheese remain curdled. Oh! Was it low-fat cream cheese? I have an 8 quart and am wanting to triple to recipe. I saw where you recommended to double to water if you are doubling the recipe…..since I am tripling the recipe, should I triple the water? Hmmm… this is a good question. I haven’t tripled it. So any advice I’d give is just a guess. I’m making my second batch this evening. Easy and delicious. I’ve mAde this a few times and it’s always delicious but tonight I made it with boneless skinless thighs instead of breast. OMG. So good! You can make this with frozen chicken breasts, and you don’t need to add any water. As the chicken defrosts as it’s coming to pressure it produces enough water. It works perfectly! Cooking time is the same it will just take more time to come to pressure. 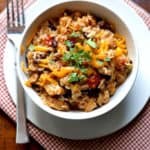 I have been making this crack chicken in the slow cooker. Tonight, I was going to make chicken cutlets and my son asked me to make the crack ckn. I grabbed my tablet and googled how to make this in pressure cooker. I followed your recipe but I added the bacon, my hubby & son would miss it. The chicken came out perfect, easily shredable. Just like you said, the sauce was runny. I got the idea to add a little thickener to it, like you would thicken gravy. It worked perfect. Absolutely love this. 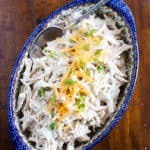 I set aside some shredded chicken without sauce for my kids – they like milder tastes, and it gets just enough flavour while cooking that they love it.